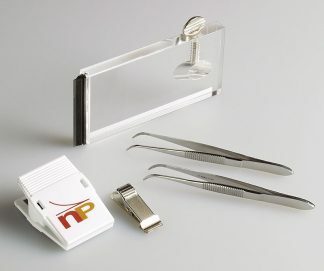 96-well funnel plates allow rapid transfer of cells and media (or other fluids) from Neuro Probe 30µL microplates (ChemoTx ® system or MP30), or from the IB-50 or IC-25 reusable inserts, into other 96-well plates. 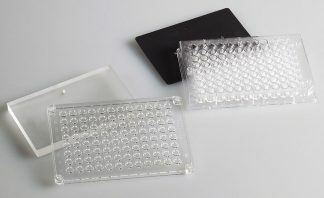 96-well funnel plates allow rapid transfer of cells and media (or other fluids) from Neuro Probe 30µL microplates (ChemoTx ® system or MP30), or from the IB-50 or IC-25 reusable inserts, into other 96-well plates. This is most often done in order to have more room for adding stains (such as MTT), etc. Place the plate with the cells on a flat surface. Put the large ends of the funnels over the rims of the wells. 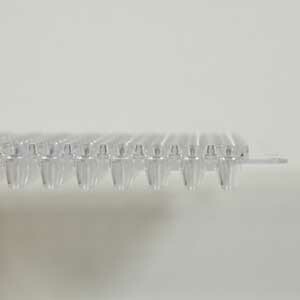 Invert the receiving plate onto the small ends of the funnels. 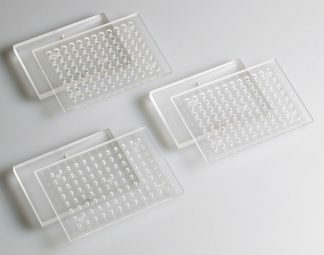 Turn the assembled plates over and place into a microplate centrifuge to spin the cells from one plate to the other.